We drove by this place on Sunday morning and the line was out the door and half a block long! We thought twice about waiting but figured it must be worth the wait. When we emerged after our filling meal I wanted to shout to the rooftops that it was worth the wait indeed! 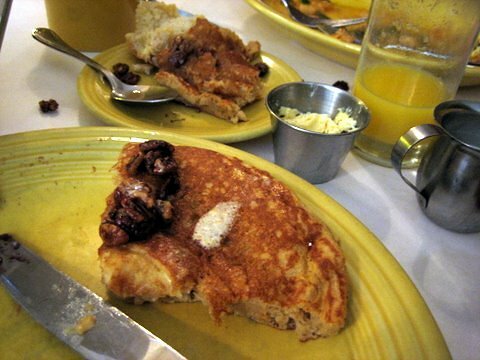 I chose to have a sweet potato pancake which came with pecan butter and caramelized pecans on top. It tasted like Christmas morning, as my husband remarked. It was sweet but not too sweet and gently spiced. 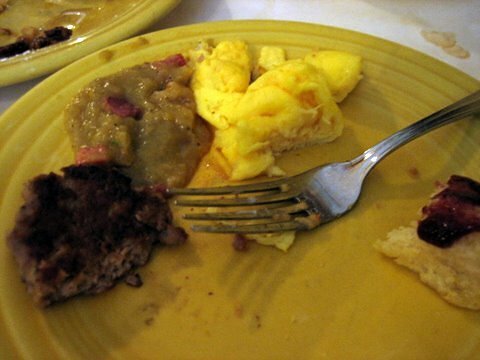 I also ordered a side of sausage patty and a scrambled egg. The sausage was amazing, especially when dipped in some of the homemade green tomato ketchup provided with my husband’s meal. Our meals also came with deliciously fluffy muffins and some wonderful raspberry jam. It seemed like a homemade or local jam. My husband ordered a special of the day which was corned beef hash. It had chunks of corned beef but wasn’t up to our expectations, too many potatoes in the hash compared with the quantity of meat. I’d love to go back here and try the dinner items, the nut crusted fried chicken sounds fabulous!